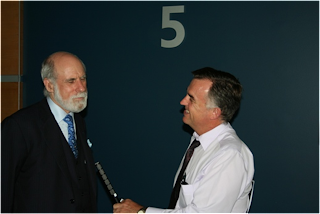 Dr Vinton Cerf interview and press conference for the official launch of ‘Hear and Say WorldWide’. 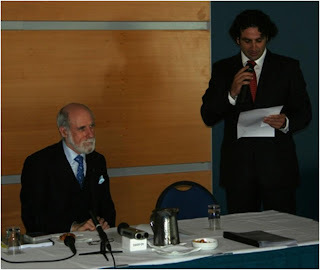 On the 8th of March 2007, Dr Vinton Cerf was interviewed in Brisbane at a press conference held by Alessandro Sorbello, director of New Realm Media. 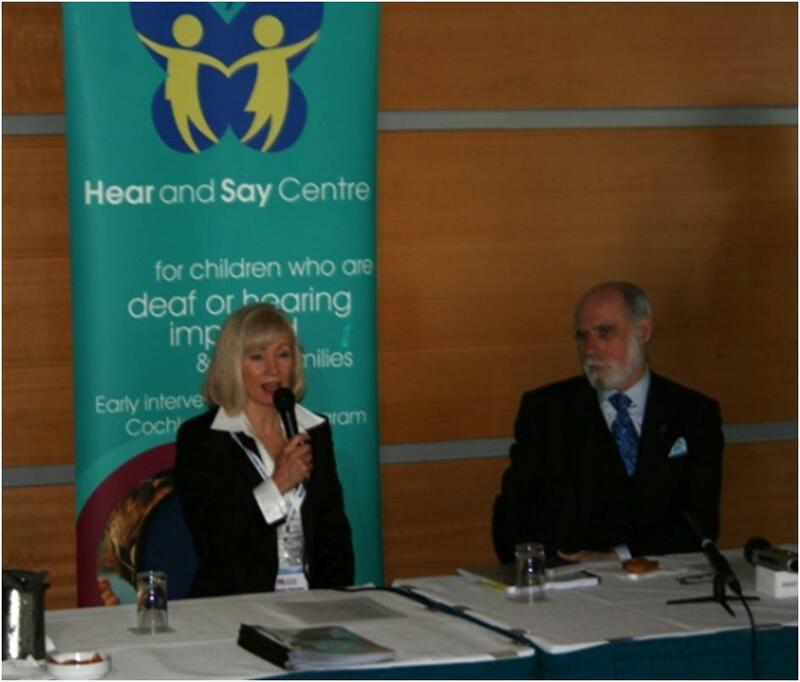 Dr Cerf was in Brisbane for the official launch of ‘Hear and Say WorldWide’. Alessandro Sorbello: Good morning, a special welcome to Dimity Dornan and to Dr Vinton Cerf. Through the Efforts of the ‘Hear and Say Centre, we have been presented with a unique opportunity to hear the thoughts of one of the great minds of our age. 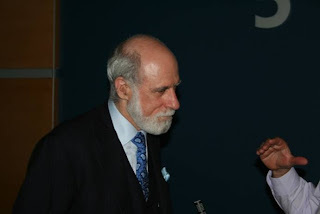 Dr Vinton Cerf is widely known as the ‘Founder of the Internet,’ Dr. Cerf is the co-designer of the TCP/IP protocols and the architecture of the Internet. 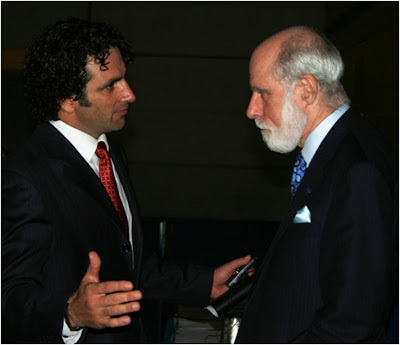 In December 1997, President Clinton presented the U.S. National Medal of Technology to Dr. Cerf and his colleague, Robert E. Kahn, for founding and developing the Internet. Kahn and Cerf were named the recipients of the Alan M. Turing award, sometimes called the ‘Nobel Prize of Computer Science,’ in 2004 for their work on the Internet protocols. Currently, Dr Cerf is vice president and chief Internet evangelist for Google. 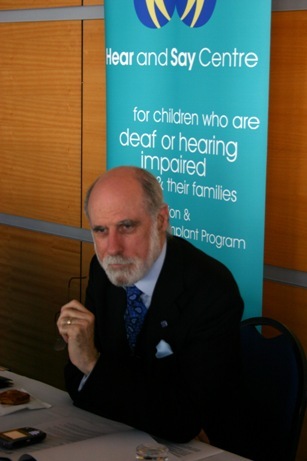 Dr Cerf is in Australia to officially launch ‘Hear and Say WorldWide’. Dr Vinton G. Cerf : Dimity came to our family by way of the audio verbal international program for teaching people how to listen and how to hear. My wife Sigrid is a double Cochlear Ear implantee, she had her first implant in 1996 and a second one last year in 2006 she was very active in this audio verbal international program because she recognize that it's not just a question of the technology it's a question of learning how to use it. It’s a question of teaching audiologists and speech pathologist and others who deal with hearing impairments, how to help someone who is using one of these assisted techniques, whether its hearing aids or cochlear ear implants or other types of techniques how to use those to their advantage. And so on top all the basic technologies which are stunning and spectacular in their nature, in fact I should say that Graham Clark, the inventor or the cochlear ear implant is here today, he gave a fabulous presentation about how the technology works and what some of the future potentials are for neuro-electronic interfaces in addition to hearing repair of optical impairments and the possibility even of spinal implants to overcome paraplegia and quadriplegia and so on. So these things are all easily predictable within the state of the art of the development of technology, but unless you actually understand how to use this and how to augment it, you won’t get the full effect. And so Hear and Say Centre here in Brisbane are going international and that's what ‘Hear and Say WorldWide’ is all about. I'm feeling a little funny about opening this particular press conference because I bear no responsibility and no credit for any of the work that the ‘Hear and Say Centres’ do, I'm a beneficiary in some direct and indirect way. Children of course are very, very important as a focus for the ‘Hear and Say Centres, the earlier that one can intervene either with hearing aids with cochlear implants the more likely it is that the child will learn to hear normally and to speak normally in the same way that those of us who don't have a hearing impairments have learned. So intervention is now technically possible as early as six months but of course you have to know that the child needs the intervention and so early detection is absolutely critical to this whole process. But perhaps even more important is the training program that helps professionals to understand how to perform the early intervention, how to use the technology and how to help children and their parents learn to adapt and make use of these techniques. My wife pioneered a number of uses of the cochlear ear implant, because she didn't have any help, she just invented ways of using these things more effectively. So as soon as she got her implant ten years ago, she phoned the library, phoned the library, hadn't used the telephone for 53 years right. So she's on the telephone talking to the library saying "I'd like to sign up for recorded books for the blind" and she wanted to hear words pronounced that she hadn't heard before she could read them but she didn't know what they sounded like. So the library said 'what's your name and address and phone number' and then they said you're blind aren't you? And she said “no I'm deaf” so there was this long pause while they were trying to figure out, well how is this is going to work. In the end she has acquired a variety of different additional devices like FM transmitters and receivers that she would use in a large auditorium, optical receivers that she can use in a movie theatre that are transmitting the soundtrack over an infrared signal that you can pick up and then plug directly into a speech processor or a head set. She carries patch cords so that when she's in an airplane she can plug directly into the armrest and hear only the audio from the movie and not the screaming kids that are in the seat next to her. So she has been very, very active in using these technologies and the way I see Dimity's work in the ‘Hear and Say Centres’ is to train our professionals to train the implantee’s and hearing aid users to make better effective use of that technology. Now I think before we get to more questions about this that committee should have an opportunity to tell you about her passion and the scope of the ‘Hear and Say WorldWide’. So Dimity can I ask you to tell our friends here in the press a little bit more about it. Dimity Dornan: Thank you Vint. ‘Hear and Say WorldWide’ is an initiative of the Hear and Say Centre that has been officially announced and launched today by Dr. Vinton Cerf. ‘Hear and Say WorldWide’ is our project which will take a message of hope that children who are deaf can learn to listen and can learn to speak to the world. Here at the ‘Hear and Say Centre our graduates have a 93% chance of success in our treatment. If you live in other countries you might have a 33% chance or less. The difference is not in the technology it is in the training of the professionals. So we at the Here and Say Centre have initiated a Global Hearing Health Care Team Education Program which will be starting off when I’ll go to Moscow on the 19th of March and then we also are funding to go into Papua New Guinea hopefully go into Germany after that. Nicola Pozzobon, New Realm Media : How would you describe man in the Internet era? Dr Vinton G. Cerf : So you can actually see some of the side effects. What happens when you get a billion people all connected together and able to interact? The first thing you notice is thanks to Tim Berners-Lee and the World Wide Web is an enormous avalanche of information coming into the network. The uses and consumers of information have now become the producers. And so when you look at things like Wikipedia you discover that its content comes from anywhere in the world from anyone who has a piece of information that may be of use to others. What amazed me is the number of people who want to share their information and they are not looking for payment, they are simply looking for credit or they simply want to contribute. So there's just this enormous quantity of information, now there's a side effect: the side effect is that a lot of information is of very little value or that it's misinformation because the person that put it up on the net is misinformed. So now there’s a problem of figuring out which information on the network should we pay attention to and what should we ignore. This is not a new problem. This problem comes up in all media: there is information and misinformation available from television, radio, newspapers, magazines, your friends and family and your parents. So you have that problem in all media and the probably the most important thing that you can teach children is to how to think critically about the information that they are getting, to try to evaluate whether or not it's useful or not. We figured out kinds of clichés to help us do this in other media for example logos on all the brands from television programs, television channels, newspapers and magazines help us figure out which means we should see, which magazines we should read, which newspapers, we should pay attention to. Of course many of you are part of the news media and I would be willing to bet that every article that you read that you didn't write, every article that you read that you actually know something about you notice that it has some little mistakes in it. And yet we don't always remember that, we notice that if we know something about that particular story but if we don't know something we sort of it that everything is correct we all know that isn't quite true. So one of these things at this global network can do is help us tease out what the real truth is because there are so many disparate points of view available to us. Blogging is an example of this, both video and text blogging. The Wikipedia is another example. Then we start see collaborative activities happening. Google is really interested in that, we put our products on the network that will help people work together in the production of a text and in the production spreadsheets and the production of other collaborative works and when you look at world war craft or second life or some of the other role-playing games you are seeing very interesting social collaborative activities going on in fact there is so the interesting that there are economists that are studying what's going on in world war craft and in second life to try to understand the social and economic experiments that have been carried out by the people who are playing in those environments. So I believe that as time goes on, we have 1 billion users at now, I'm predicting 3 billion users by 2010 (half the world's population roughly speaking). A very large fraction of those users will be getting access by mobiles like this Blackberry. That has shaped the way in which many companies have been producing content on the network why they are adapting that content to be reasonably accessible through the small displays. Keyboards are accessible to people who are three inches tall and sometimes limited bandwidth. So a very large fraction of the world's population may be introduced to the Internet through these devices and eventually through broadband access. I should remind you that Australia has a very, very high penetration of Internet use something on the order of 70% of population has access. A smaller fraction has access with broadband and I anticipate several evolutions there: one of them is that more people will have broadband access but a lot of that for consumers is asymmetric, which means you can pull in it faster than you can push it out it's easy to predict that people are going to demand symmetric access to the network at the time for the same reason that businesses already get symmetric access to the network. So the net all of this is that we are going to see an increasing number of applications in which the users are producing information as well as consuming it. What's the connection between what you have done with the Internet and what you are doing with Google and your development of Internet forming those protocols and what you are doing now. Dr Vinton G. Cerf : The closest I come to connecting these to is that my wife has these cochlear implants and they have speech processes I want to reprogram the speech processes so that it does Internet protocols so when she is plugged in to the Internet and asks a question, which goes into the speech processor, the speech processor is going to send that question as sound, digitized sound to a computer on the Internet which can understand speech and then send the answer back to her which will appear in her head because it’s going straight back to the speech processor. That's my next little personal project. 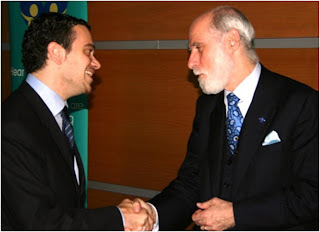 Dr Vinton G. Cerf : It is not hard at all. I found something like this with TCP/IP is easy so it's all within the state-of-the-art there's nothing I said that cannot be done in a couple of months time. So imagine being able to talk to the Internet and get answers back in your head that no one else can hear. So now we have people cheating on tests that's terrible. Patrick Gray, Sydney Morning Herald: I'm wondering though this meshing of technology with biology which seems to be something that a lot of futurists seem to be speaking about Richard Clarke schism speaks about trans humanism do you think this has potential to get out of hand to create. When the secure become an enhancement when does a wonder the lines begin to blur between technology which allows us to function normally and technology which enhances. Dr Vinton G. Cerf : This is an absolutely wonderful point I took a comment and a lot exactly along those lines in an earlier speech this morning. The question is whether we draw the line between repairing impairments and enhancing capabilities and I think the answer is I think we should not draw that line there is nothing that should stop us from taking that same technology that brings someone into the normal mainstream of hearing for example and actually allowing people to hear sounds that other people could not hear of there is nothing that would stop you from building a speech processor that actually except a signal from at 40 kHz for example and step it down into a preconceived range at the wrangle detect. You could actually imagine the same sort of thing with ocular implants normally would be repairing blindness allowing people to see in the normal visual range. Patrick Gray, Sydney Morning Herald: Who decides who gets access to this technology and capabilities? Is it solely determined by who can afford the technology? What implications are there for the society when you have soupy humans running around with? Dr Vinton G. Cerf : Well first of all let's not get too carried away out of so that all technology tends to be of the available to people who can find the way to afford it or in the case and my wife both of the implants were played by insurance policies and also the kind of technology we are talking about are not necessarily at the well named would trade a person who would be dangerous which is an implication of your comment. We're not talking about cognitive implants if I were to write Kurzweil and I were telling you about the same deep similarities now I might be saying well that humans are computers are evolving very quickly and by 2030 there will be computers that will be capable of thinking faster than human beings. Personally I'm sceptical of this but if you wanted to worry about something you should worry about that rather than worrying about any plot that happens to be used to better capabilities that we normally inherit from our evolutionary trajectory as to who decides what it's availability that counts you could ask the same question of eyeglasses you could ask the same question in hearing aids you could ask the same question of clothing. People who have access to better incomes and have more disposable incomes often get better treatment whether they get better information whether they get better health care that's not going to change. It's been a fact of life for a long time. Our objective in the objective of the Hear and Say Centre is to bring both the technologies and the use into reached for more people which is one of the reason that this expansion into worldwide is so important. Patrick Gray, Sydney Morning Herald: How far away is this technology? Dr Vinton G. Cerf : The optical implants for example and the spinal implants, my view which is relatively uninformed, the person who could really give you their information is grand plot was working the technology that I would guess that optical implants and spinal implants are probably at the same stage of development now as the cochlear implant was 20 years ago in 1986 or 87 so we're looking at a decade or two of development work before those things could make sense. I am confident however that these are feasible because we are not talking about trying to read your mind or to get electronics to elect interact with you at a cognitive level these devices are interacting with you at a sensory level; this at a century level these are things we understand a lot better we don’t understand how the brain thinks but we do understand how the body transduces signals to produce sounds and signals that are interpreted as sounds or signals by the brain. In the case of my wife this is actually - let me make it less dramatic than it sounds - I could do what I was describing for sacred by having her speech process program to plug in into the Internet you could do is just as easily by sitting with a microphone and a headset in a laptop you could speak a question have that digitized, turned into packet, sent across the network a computer could interpret the sound which by the way does when you make a fine call to various user help lines for example self-service lines you're often talking to a computer who is understanding speech it sends the responses back and those digitized responses and packetized speech will sound like sound in your ear and so all I'm doing is replacing the headset with the cochlear ear implant. It's just kind of cool that the whole process means that there's no sound ever being produced in the response it's all happening in your head but it's not a cognitive interface I don’t want to mislead anybody into thinking otherwise. Dr Francesco Capecchi, Italian Consol for Queensland and Northern Territory: In 1998 you have been awarded by the Marconi prize for lasting contribution to human progress in the field of communication, science and the Internet and so I was wondering how do you feel about this weighty recognition and especially since I'm representing Italy here about Marconi's role in modern communication. Dr Vinton G. Cerf : Well Marconi is as all you know I hope know is credited with the invention of radio if you dig deep into the history you'll discover a number of other names that were contemporary with him. But I want you to think for a moment about what it must've been like in the 19th century let's go further back than Marconi, let's go to the 1840s and Morse code over wires. Up until that time the fastest you could move a signal from point A to point B was as fast as the train could go or as fast as a horse could ride, now suddenly you could send a signal at the speed of light this had to be a stunning revelation for the people in the middle of the 19th-century. Then Marconi comes along and he does it without wires, still at the speed of light that had to be even more amazing, you're sitting in Europe and communicating in real time with someone in the United States without any wires at all. There's a book I would recommend to you called “The Victorian Internet” it's by a man named Tom Standich and it's all about the telegraph and if you were to read the press announcements about the telegraph and Marconi's wireless capabilities in that 1990/1991 period. If you replace telegraph with Internet you would recognize the headlines. As far as the Marconi award goes there's a small cadre of people who'd been recognized with this award about 30 or so i would guess by this time it is a huge honour and a terrible responsibility. Because it is not an honour which is conferred solely for that which you have done in some sense it is conferred with the expectations that you will keep doing so I personally feel very, very challenged to earn each year that recognition as to my colleagues and so I hope that participating in activities like this, looking for new ways to apply Internet technologies in the social realm will earn, once again that recognition. I can tell you that it's a great challenge to really be worthy of the recognition because it requires a hard work each year. Question; The Internet is a means of democratization but it's also a means of standardization. What are your reflections on this. Dr Vinton G. Cerf : The answer is yes. Some people think that standardizing means a suppression of creativity. I consider this to be completely invalid reasoning. Standardization creates opportunity for innovation. So by way of example by standardizing the Internet protocols in saying that I'm out of where you are in the Internet when you plug in your compatible with 400 million other machines on the system if you want to invent a new application the standard permits anyone who is part of the net to absorb the new technology that you've offered that's why the peer-to-peer applications and the Skype applications have propagated so quickly: it's called the end to end principle. It says that the network doesn't know what applications it is supporting it says that you invent the applications at the edges of the net; so I see standardization as a powerful, powerful tool to create interoperability in and out the net and therefore an opportunity to create and to innovate. With regard to democratization I feel strongly that the Internet is one of the most democratizing technologies ever invented. It has all the good and bad characteristics of democratization and all of you will remember from a famous close game that “democracy is a messy terrible system but it is better than anything else it has never been invented”. Once the Internet became publicly available which wasn't until 1989 actually you got all of the side effects of the general public using of the technology, all the good stuff and all the bad stuff. I consider the Internet to be a kind of mirror of the society. You look in America see all the good things and bad things about people of course some people say you should fix the mirror and my reaction is it doesn't help to fix the mirror you gotta fix the people if you're concerned about the way they're behaving. I see the democratization as being a very, very powerful force and it's an interesting one because it's an erosive kind of force that may take time. So visually I think of the Grand Canyon in the United States that started out as a floodplain and a river was running through it and at some point it carved it and after several hundred million years it has become this enormous canyon. I look at countries like China that exhibit concern about freely available information looking for ways to inhibit some of that information exchange. Over time that will erode. I believe that society will adapt and eventually recognize the utility of the broad sharing of information that they've been in a very restricted environment for many decades and it takes time. So I'm very patient about the technologies and their abilities to open up all would otherwise be as limited environments. Patience and persistence are two great values and I can tell you that Graham Clark was patient and persistent in the development of the cochlear implant and as I read his story the dates paralleled important milestones in the Internet and I remember thinking I wish we'd known each other we would have commiserated with each other about the incredible barriers we got in the way of producing the technologies. Are you disappointed with the take-up of ID P6 paragraph? Dr. Vinton G. Cerf: Yes, IDP six was standardized in the early 1990s the version of Internet that you are using today was standardized 1978. It was roughly 5 years after the experiment was begun and at the time it was still an experiment the number of terminations that could be supported by IDP version 4 was 4.3 billion. When I made the decision in 1977 to use a 32-bit address space which multiplies out to 4.3 billion I thought this was still an experiment and I thought 4.3 billion terminations ought to be enough to do a pretty good experiment what I didn't understand is the experiment was not going to end. The network was simply going to keep growing, so here we are in 2007 we are well within visibility of running out all the unique addresses of the Internet I want to distinguish the numerical addresses of the Internet from the domaining system which is a completely separate layer which does not look to me like running out at all and I doubt that it ever will. We can see potentials for running out the spiked fact is that there are out network and access translation boxes that artificially expand the address space in ways which are quite damaging to the end to end protocol. So I'm pushing very hard for ID P6 to be abducted, at the moment software exists for all routes, software exists for all the computers, laptops, desktops, services, and the alike forms. All the main software makers, Microsoft, Apple, Linux and the various UNIX derivatives, all have IDP seeks to detectability. The Chinese have already announced that they are well along in implementing IDP six nationwide they wanted ready and operating for the Olympics. I was just in Beijing last week I had a chance to see the work of the Chinese electronics and rigid educational research network which is all IDP 67 have demonstrated full capability to run a an IDP 6 application suite. So you will find me repeatedly pressing to get IDP implementing at the ISP level and I'll be very unhappy until I’ve actually seen that happening. Alessandro Sorbello: Have you ever sit back and reflect on the usage of the Internet worldwide and are you entirely happy with the way it's evolving the content and use. 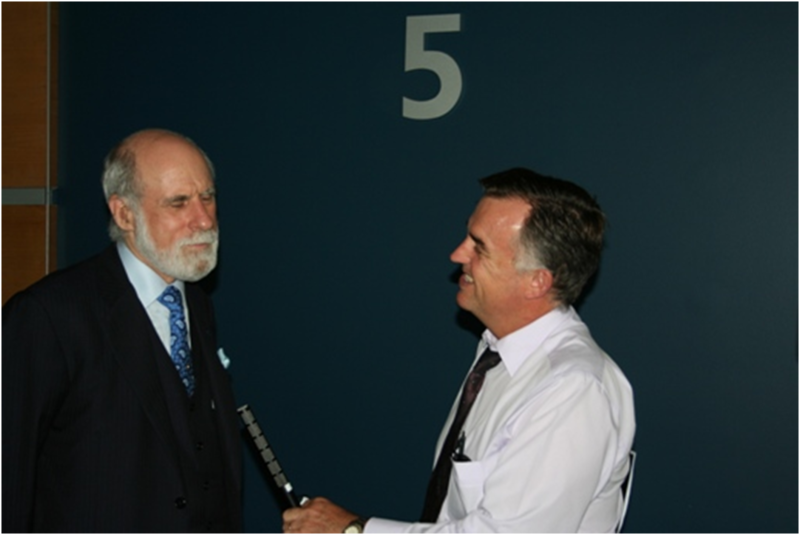 Dr. Vinton G. Cerf: Well obviously I have watched this thing evolved for the past 35 plus years. I have two reactions, first of all I believe that the spheres especially after team Tim Berners-Lee introduced the world wide web and became commercialized by Netscape communications and then Microsoft and so on. I believe that has triggered an enormous amount of information to flow on the net and I see that it is generally useful. If you like me when you have a question that you don’t have an answer to any Google it and it's amazing how often you actually get something useful out of that process, so on that score I'm really very happy. Doctors tell me the patient is a very well-informed. Students are more able to find information of course some of them try to cheat by getting in a paper it is already written; the tools are available for teachers to recognize when the students have been plagiarizing the material the seeds of the solution of that problem are hiding in the technology. I'm not happy that there is bad content on the network I'm not happy with spam I'm not happy about viruses and worms. I accept that some of this behaviours (bottnets for example) are driven by economics, driven by people who believe they can generate revenue from these kinds of abuses. I don’t think that we can defend against the mentality by using only technical means although there are very specific things we should do in order to minimize at least some of the abusive behaviours for example if we were overusing IPV 6 and one of the features of the six is that you can always go into fully encrypted moulds between sources and computers on the network. That would actually blunt the number of attacks that can be made against either of the two communicating computers because you can't see deeply into the packet it's been encrypted at the IP layer. We could be checking the sources from another address the packets going into the system and rejecting those that are certain addresses that are patently faults sometimes spoofing of the source IP addresses used as a tool for launching certain kinds of attacks. We could do a better job of detecting viruses and worms, we could certainly do a better job of building operating systems that are less vulnerable to be invaded and turned into zombies that are part of the .net armies. The domain name system itself could be reinforced using what's called DNC which is where the digitally signing the domain name information that's been announced now Sweden is digitally signing its root sign files to DNC the top level domain name to Sweden. The Internet Corporation assigned names and numbers which is ICANN is rapidly moving toward supplementation of DNS sector the rate and encouraging all of the top level providers to digitally sign things. So there's a whole of things that we could and should be doing to deal with some of the abusive behaviours on the net but not all of that could be defended against technically some of it requires us to do some of things that we have done in other domains where we see socially unacceptable activities but we tell people if we catch you doing that there will be consequences but we have to do that on a global scale because the Internet is global and is frankly insensitive to national boundaries from the most part. Settle in a cooperative work among governments in order to enforce various kinds of response to inappropriate and antisocial behaviour on the network. We have just been talking about democratization, Wikipedia and democracy. The evolution of the Internet is following several trajectories. Is it still something related to democracy or is it a mob rule? Dr. Vinton G. Cerf: It's a very good question, it's not too different from talking to the Oxford English dictionary guys that will say it is part of the language even if you don’t like it I would say we have two important lessons that we must teach people about Internet specifically and more generally about information that we get. The first lesson is that not everything that you hear and see is correct and that’s true for an old media, not just the Internet. The second thing it seems to me is that the antidote for bad information is more information as opposed to attempting to filter in some fashion even when the information appears to be valid and it comes from a really good source we could be interested in looking for something deeper. The good thing about the online environment is that you can change the information easily; the bad thing about the online environment is that you can change the information easily. And so one lesson is to understand that not everything is fixed and true for old time the third lesson that I feel very strongly about is that people who think that they have done their research because they did a search on the Internet are wrong. Someday I hope that's not true Google, hopes that it will someday get to the point where all of the information is in fact can be interrogated through the Internet even things that are locked up on paper today, someday becoming at least indexed. So particularly for medical research if you do a Google search or any kind of search on the net saying “I'm down I want to know everything I'd need to know to get better”, well may be there are information in other media that you should be looking at that you have not found simply because you looked on the Internet. So I want to reinforce that message to young people especially who are so comfortable with the Internet it's always been there for them they can't imagine living without it and yet we have to make sure that they understand it does not contain only information on demand. It would be wonderful to imagine that all the information we ever knew and all the information that we know can be accessible by fingertips. It is not actually true, but it could be true in the future. Larissa Dubecki, Journalist The Age: What new things have been on the net in the last years in general? Dr. Vinton G. Cerf: So I've already mentioned a little bit about mobiles and broadband and things like that. This is a clear trends that you can anticipate. I think the other very clear development which I'm very happy to participate in has to do with the extension of the Internet to operate across the solar system and this is the interplanetary Internet up in working with that on what the 'Jet Propulsion Lab' since 1998 and we are well on the way to standardizing interplanetary protocols. Some people immediately assume that Cerf is crazy because he must believe in aliens because he's building this in the planetary network and hoping that hoping that somebody will come. No, the real answer is that we want to support space exploration with robotic equipment and humans using better communication systems that we have today in deep space something that's more flexible and standardized like the Internet would allow us to reuse and reuse resources that have already been put out there from previous missions of which can then be repurposed. We've already done a little bit of that manually with the orbiters around Mars and the Rovers that are on the surface. Going well beyond that no one of the questions that comes out has to do with how we interact with the network and one of the things that we do not do today which I would like to see a spoken interaction with the content of the net if you're blind and the only way you have two interact with the information is to speak in here then you'd like the Internet to be as accessible as if it would be accessible using a keyboard. This would not only benefit people who are blind but it would also benefit people who are illiterate there are very, very large number of people in the world who can speak and hear but who cannot read and write. A lot of the Internet content is inaccessible to them today and so one of the developments which I don’t want you to infer it as necessarily a Google initiative but it is a personal desire of mine that we make spoken interface as effective as possible in addition to the kind of point-and-click type in the face that we see today. I can speculate about one other thing a large number of senses are going to be on the network, billions of these things scattered a letter the world in parks, building stinky wearing ties its in offices at that time in order to keep track for example what's going on in the world around us and global warming is a big issue in some of the things that we need to know are going to be derived from major sensory networks which a part of the network but also you can imagine the systems are aware of this building like it and when here who is in here and how should I adapt my behaviour to be more effective for the people who are in here that kind of responsiveness is possible as the world in which we live in becomes more aware of us as opposed to how we have to adapt to it.